Tacos are everywhere in my hometown of Austin, Texas. People eat them all day - even for breakfast! Once I warmed up to this delicious food, I wanted to find an affordable, fast way to prepare a vegan version at home. Ready in just 15 minutes, this delicious recipe will leave you satisfied. As an added bonus, it's also much more affordable than eating out and can be adapted to a variety of tastes. It's even gluten-free. Read on for the recipe and variations to suit any budget! Click the "Print Friendly" button below for a printable or PDF version. Drain tofu and crumble into a large pan. Sauté for 5-10 minutes, stirring occasionally, until lightly browned. While tofu is cooking, start 2 cups water boiling in a saucepan or steamer. 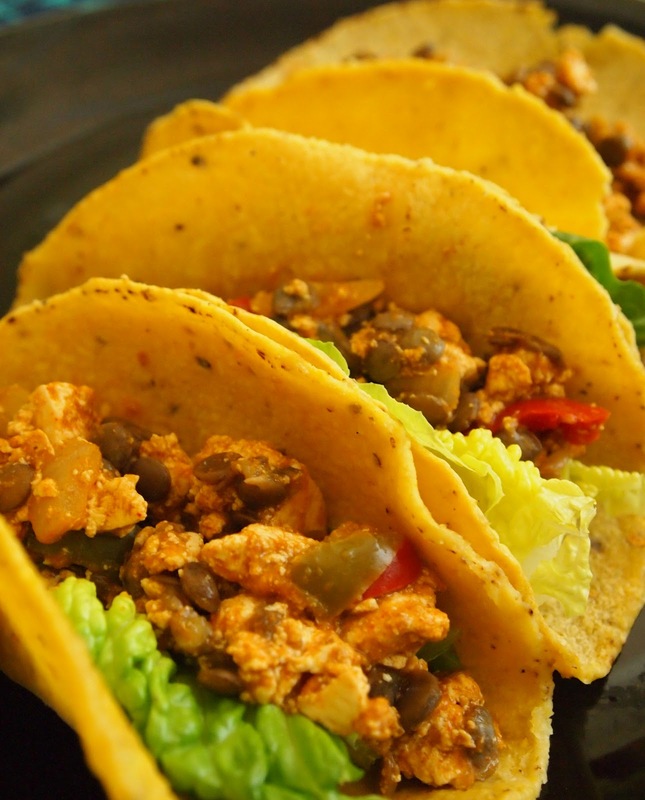 When tofu is browned, add prepared taco seasoning, beans, and veggies. When steamer or saucepan is boiling, place a few corn tortillas in a steamer. (Or set in a colander and place above saucepan, covered lightly, leaving space for steam to vent.) Steam for 3 minutes or until supple. Remove from heat. Prepare tacos by layering a piece of lettuce, then spooning in the tofu mixture. Note: I was out of black beans when I made the recipe for the photo. I used leftover lentils instead for a tasty twist on the original!